I touched up on my interest in art previously, citing some principles I learned during my younger years when I was much more involved in art, which I had now applied to my moto-art project. Thing is, my involvement in art really was much more than just an interest. It was as encompassing over my life then as motorcycling is to my life now. It was all I cared to be doing, and it always made me happy to be doing artistic things. I was always doodling something, drawing to my heart’s content, and I dabbled in any other form of art that was thrown my way with gusto. It was a bit like how I would be riding now for little to no reason, and I’d probably ride anything you give me with two wheels and an engine. If motorcycling is at the center of what makes me feel alive now, art was my driving force back then. I think it was through my passion for art that I look at the world with a pair of creative lenses over my eyes, looking past what’s there and seeing the pieces that make the whole, and the colors and textures that fill it. 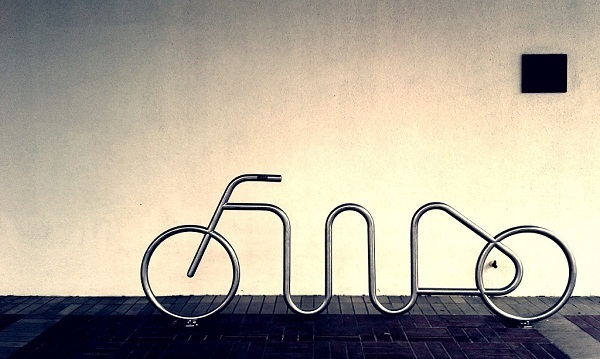 I think that's why when I look at a motorcycle now – any motorcycle – I see it as a rolling work of art, and the components that make a motorcycle – wheels, chassis, cases, welds – are pieces of art by themselves as well. Or why else would I have a clutch basket on my desk at work, or a real forged aluminum motorcycle wheel? Yup, that’s right. 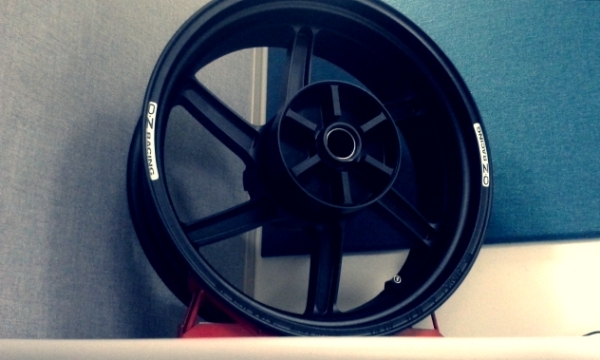 There is a real motorcycle wheel on my desk at work. This is a forged aluminum motorcycle wheel on my desk at work. I told you. This amalgamation of two interests from two periods of my life probably found its catalyst when I became very good friends with a CNC-machinist. 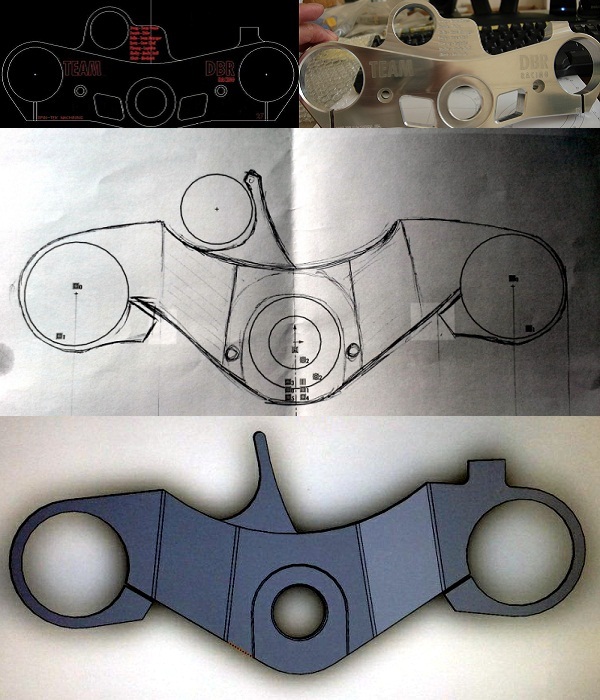 When my friend had let me design my own upper triple clamp for my R1, which he then recreated digitally with the actual measured specifications from my motorcycle’s part, it set me down the path that would find my previous passion for art come head-to-head with my current passion for motorcycling. It’s quite a feeling to see something you’ve drawn up, come to physical form. It’s an amazing experience to have imagined something in my head that I then put down on paper or other form of media, and eventually find it come to life sculpted out of a block of metal. Then being able to use that component in my motorcycle, where I can see it every time I looked down on my bike – it really is my two worlds melded into one. My only wish was that I was the one that programmed his machine to sculpt my design, or even better, that I was the one that did the sculpting. And having refinished another person’s unfinished motorcycle build more recently just makes that wish of having the skills and know-how to cut, bend, and weld metal into shapes and forms I can use for a motorcycle that much more strong in me lately. It’s as if I’m no longer satisfied just designing parts of a motorcycle. I now want to make them myself. There are places one can go to learn metal working, to use the tools available now to be able to cut, bend, and weld metal to one’s liking, and I’ve been thinking lately that once I have the time, perhaps I should look into enrolling in such schools. Then I find myself irritated for a bit, because I ask myself, “why didn’t I learn them sooner?” Why didn’t I take automotive or metal-working classes back in high school? I could’ve had an earlier head-start, maybe spent a few more years apprenticing since, and maybe find myself a seasoned fabricator now. Instead, I took two years of French in high school, in a town populated mostly by Hispanics. I’ve never even been to France, and have never had the interest of going.